Just as the ‘dream’ of 1915 became the reality of having a school for deaf children in Cincinnati, Ohio, the reality of teaching Deaf and hard-of-hearing students at St. Rita School for the Deaf continues into the 21st Century. Our original ‘roots’ are evident as we continue to work with all deaf and hard of hearing students who enter our school. At St. Rita School for the Deaf, we work to educate Deaf and hard of hearing children within the classroom as well as giving Deaf and hard of hearing students avenues to grow socially. Daily classroom teaching presented via sign language, small classroom numbers for increased individualized instruction, socialization with Deaf and hard of hearing children, Deaf adult role models, all contribute to the well-being of the ‘whole’ Deaf and hard-of hearing child. The diversity at St. Rita School for the Deaf mirrors the diversity of our world; diversity that encompasses the classroom, diversity that encompasses after school activities, and diversity that is evident throughout the halls at St. Rita School for the Deaf. 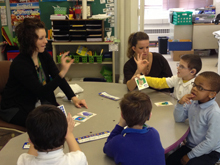 For nearly a century, St. Rita School for the Deaf has been serving the educational needs of deaf citizens of all ages. The combination of our experience and vast network of contacts places St. Rita School for the Deaf in a unique position to effectively serve the entire Deaf Community. A strong commitment to excellence and personalized attention is demonstrated in every Residential Life program. Relevant activities, state-of the-art equipment, special devices for deaf and hard of hearing students and a highly dedicated Residential Life staff ensure each student a well-balanced, comprehensive educational experience.